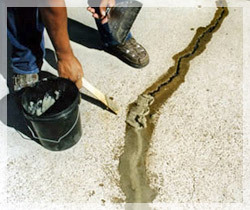 Crack filling is a common maintenance activity done to seal the cracks on walls and pavements. Often, certain walls or pavements expand and contract due to changes in season and temperature. Consequently, cracks also expand and get bigger seeping more and more moisture in. The technique of crack filling eradicates destruction by such seasonal changes by combating these factors and also extend the service life of the masonry.Build-care water proofing is on of the best Crack Filling Contractors Cochin. How do these cracks appear? It’s possible for the mason to be in a haste, or build a wall when conditions are not proper. He might not prepare adequately for the conditions he’s working in. He may throw lots of junk in the trench by the walls as it’s being built, and that can create issues later on. He may put the wrong size sill plate on the wall, creating lateral pressure on the wall, or he might back fill too soon after building the wall, while the concrete is still curing. Footers (the things your foundation sits on) may be built on loose material. It might expand or contract over time because of the weight on it, or you may be in an area with soils that move. In any case, settling results from the shifting. What you’ll see is cracks that develop from that settling. Like walls and roof, the foundation of a house should be maintained periodically. The coatings put on the walls can break down over time, allowing water to come in contact with the concrete. Once that happens, that water begins to affect the strength of the concrete. At that point you might begin to see discolorations, water, cracks, or even bowing of the walls. Time breaks down just about everything. The fact is, basement structures probably only last a hundred years or so, and then they need replaced – and that’s if no other outside factors are involved. Add settling, shifting, expansive soils and outside pressures, and you can cut that number down considerably. • After proper curing two coats of roof coat on the cracked areas. If any serious crack in building don’t be afraid,Build-care water proofing is here to help you, The best Crack Filling Contractors Cochin.